March: Food, Food, & Food. Not That I Could Eat Much of It. What have I been up to in the month of March, you ask? As someone who has been extremely ill battling a serious recurring case of Lyme Disease, I dare say not much. I’ve been home in bed the majority of the time, on loads of various medications–though slowly (thankfully!) getting better. But nothing, I say nothing, could stop me from two events held in NYC earlier this month. The International Restaurant & Foodservice Show of New York, and the annual C-CAP food fundraiser. Well, I photographed both and managed to eat some of the dishes, too! These free-for-food-press-and-photographers events are some of my favorites of the year. At the Restaurant Show, one can watch food competitions, taste everything from regular pizza to Japanese noodles in shiso broth, and attend informational sessions with industry experts. 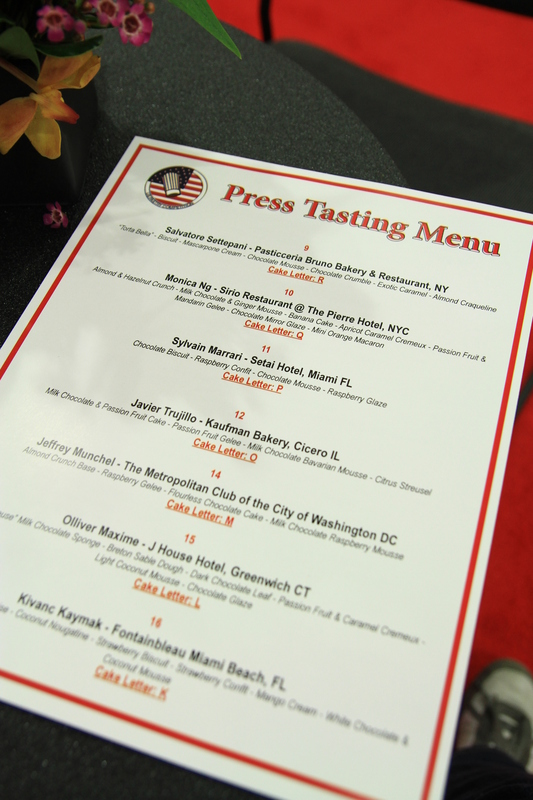 But one of the highlights this year was the press tasting of the U.S. Pastry Competition. With champagne and a private seating area, one could order up a dozen-plus samplings of the very cakes the judges were tasting just feet away. My favorite was a non-chocolate cake filled with layers of mango, strawberry, and lime gelees, alternating with biscuits, creams, and mousses. When the slices with hazelnut ganache and chocolate cream filling came around, there was no way to eat more than a bite or two before passing out in a sugar coma. Besides baking, competitors had to show their sugar and fondant prowess with themed sculptures standing 6 feet high (pictured). Incredible! Aside from three days of the food show, I also was a photographer at C-CAP’s biggest event of the year, the Annual Fundraiser. The nonprofit Careers in Culinary Arts Programs is headed up by my friend’s father, so we’re always at this massive event (which raised $900,000 this particular day) to help out and, well, eat. I couldn’t do the latter too well, but I did meet Marc Murphy, took photos of Daniel Boloud, and schmoozed. No, they don’t fool around here. C-CAP funds elaborate cooking programs in low-income areas throughout the nation, then awards scholarships to send them to the CIA and other top cooking schools. Many graduates now run their own restaurants, are executive chefs, have won James Beard awards, and have their own families. One night a year, 40 chefs (including grads) converge in Chelsea Piers, are teamed up with a C-CAP student, and serve gourmet dishes to Manhattan socialites. It’s a great evening. This year I could only taste a few dishes, but I did enjoy most graduate Thiago Silva’s dessert of sticky coconut cake with mango sauce, braised pineapple, candied pistachios, shiso-lime syrup and coconut water sorbet (from The General restaurant). There were also quail egg-filled ravioli, balsamic-braised root vegetables, Peking duck, chocolate terrines, and tons of other dishes to fill up patrons from all around the country. I had an enjoyable time but needed a week to recover from all of the events. Until next time—over and out.